Geological oceanography is the study of Earth beneath the oceans. A geological oceanographer studies the topography, structure, and geological processes of the ocean floor to discover how the Earth and oceans were formed and how ongoing processes may change them in the future. Geological oceanography is one of the broadest fields in the Earth Sciences and contains many subdisciplines, including geophysics and plate tectonics , petrology and sedimentation processes, and micropaleontology and stratigraphy. Geological oceanographers study many features of the oceans such as rises and ridges, trenches, seamounts, abyssal hills, the oceanic crust, sedimentation (clastic, chemical, and biological), erosional processes, volcanism , and seismicity. Many different tools are used by geological oceanographers. For example, the structure and topography of the ocean floor are studied through the use of satellite mapping, which measures the level of the ocean surface to estimate the shape of the ocean floor. A detailed study in 1978 by the National Oceanic and Atmospheric Administration (NOAA) involved the Seasat satellite which produced frequent, short pulses of microwave radiation to measure the level of the surface of the sea with great accuracy (within 3 centimeters or 1 inch). Underwater mountains and valleys cause subtle variations in Earth's gravitational field. The stronger gravity near high massive formations attracts more water molecules, raising the level of the ocean slightly. Similarly valleys on the ocean floor produce weaker areas of gravity, so the level of the ocean will be lower. Using this technique, a complete survey of the ocean floor was accomplished. Seismic techniques are used to measure the subsurface structure. This type of study is carried out by teams of two ships: one fires an explosive in the water and the other uses sensitive instruments to record the sound waves as they reach the second ship. Some waves travel directly to the second ship; others travel to the ocean floor, are refracted (bent) within the layers of sediment, and then travel to the second ship. By measuring the time it takes for the energy to arrive and the distance between the boats, the thickness of sediments and other features can be determined. Structures may also be analyzed by studying natural earthquake waves that travel through deeper oceanic rocks and may be recorded at stations around the world. Geological oceanography and coastal geology are closely related yet distinct disciplines. Geological oceanographers study the rocks and structure of the ocean floor, the oceanfloor sediment that covers them, and the processes that formed them. 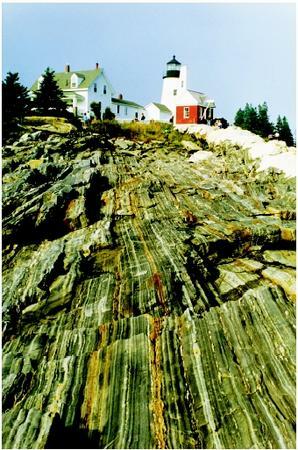 Coastal geologists focus on these structures and processes in a coastal environment (shown here). Other ways oceanic sediments are studied are by dredging processes and deep-sea exploration projects such as the Ocean Drilling Program (ODP), which obtains samples of seafloor sediment from the entire world. The ocean sediments are found to consist of rock particles and organic remains whose compositions depend on depth, distance from continents, and local variations such as submarine volcanoes or high biological activity. For example, clay minerals, which are formed by the weathering of continental rocks, are carried out to sea by rivers and are usually abundant in the deep sea. Thick deposits of weathered rock material, commonly coarser than deep-sea clays, are often found near the mouths of rivers and on the continental shelves. Universities and private individuals, as well as governments, have established institutions and programs for the study of the ocean; today about 250 such entities exist. Examples include the Ocean Drilling Program, funded by the U.S. National Science Foundation and 22 international partners to conduct research into the history of ocean basins and the nature of the crust beneath the ocean floor; Sea Grant, a university-based program that receives support from the U.S. Department of Commerce through NOAA and that studies all aspects of the ocean, including geological, chemical, and physical processes; and RIDGE (Ridge Interdisciplinary Global Experiments), a program funded by the National Science Foundation whose the primary objective is to understand the geological, chemical, biological, and physical oceanographic interactions between the oceans and the midocean ridge system, which forms the plate tectonic boundaries between diverging plates. Notable U.S. oceanographic institutions include: Scripps Institution of Oceanography in San Diego, California; Woods Hole Oceanographic Institute at Woods Hole, Massachusetts; Lamont-Doherty Geological Observatory of Columbia University in Palisades, New York; the University of Miami's Rosenstiel School of Marine and Atmospheric Science in Miami, Florida; the University of Washington in Seattle, Washington; and Oregon State University in Corvallis, Oregon. SEE ALSO Coastal Ocean ; Hot Springs on the Ocean Floor ; Mid-Ocean Ridges ; Ocean Basins ; Ocean-Floor Bathymetry ; Ocean-Floor Sediments ; Plate Tectonics ; Tsunamis ; Volcanoes, Submarine . Ross, David A., Introduction to Oceanography. Boston, MA: Addison-Wesley Educational Publishers, 1997.